Bar ents Sea Ec osystem Re silience under global environmental change Data workshop Tromsø March 2011. 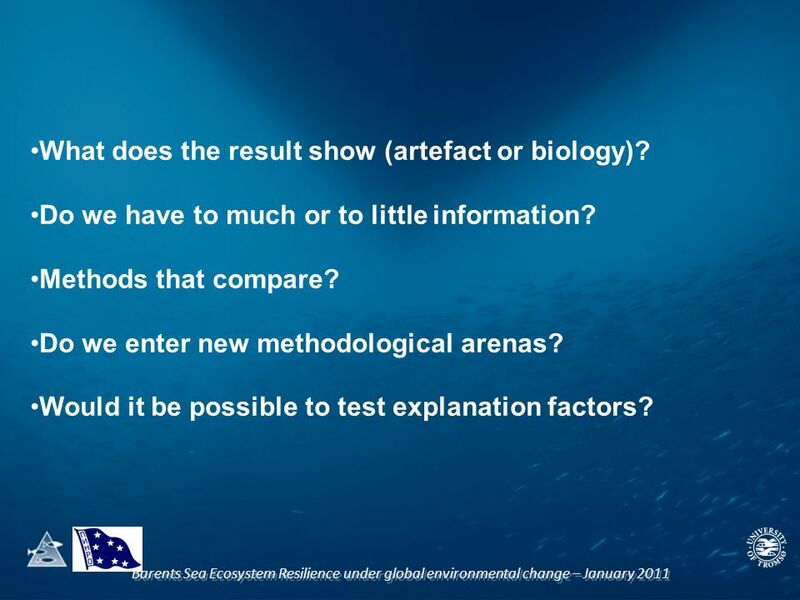 6 What does the result show (artefact or biology)? Do we have to much or to little information? Methods that compare? Do we enter new methodological arenas? Would it be possible to test explanation factors? 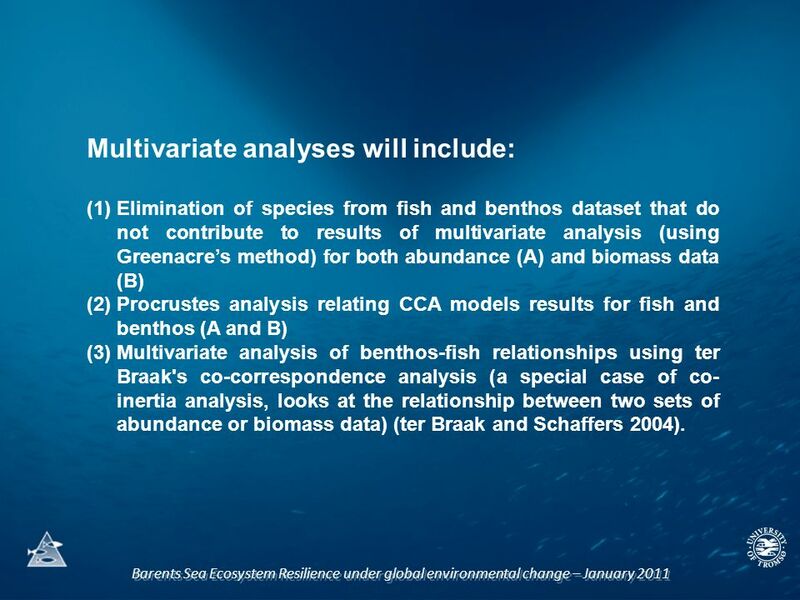 7 Barents Sea Ecosystem Resilience under global environmental change – January 2011 Multivariate analyses will include: (1)Elimination of species from fish and benthos dataset that do not contribute to results of multivariate analysis (using Greenacres method) for both abundance (A) and biomass data (B) (2)Procrustes analysis relating CCA models results for fish and benthos (A and B) (3)Multivariate analysis of benthos-fish relationships using ter Braak's co-correspondence analysis (a special case of co- inertia analysis, looks at the relationship between two sets of abundance or biomass data) (ter Braak and Schaffers 2004). 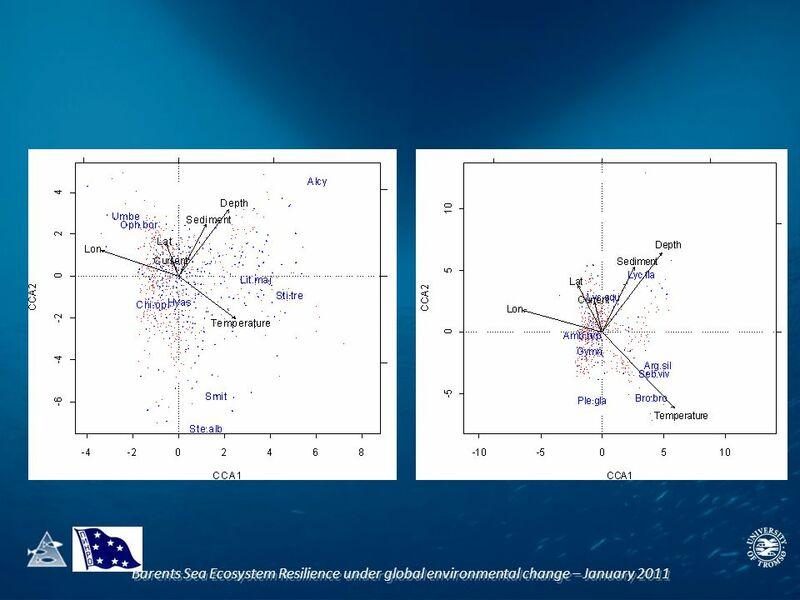 8 Barents Sea Ecosystem Resilience under global environmental change – January 2011 8. 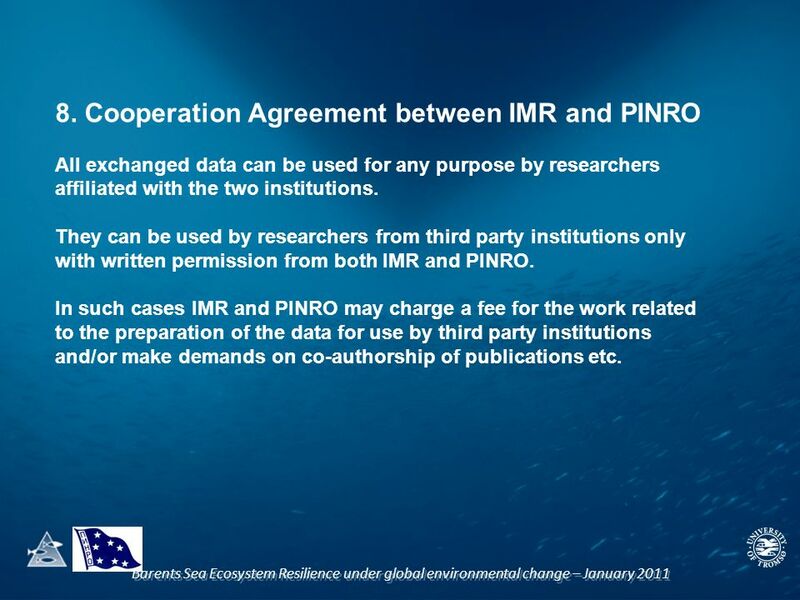 Cooperation Agreement between IMR and PINRO All exchanged data can be used for any purpose by researchers affiliated with the two institutions. They can be used by researchers from third party institutions only with written permission from both IMR and PINRO. In such cases IMR and PINRO may charge a fee for the work related to the preparation of the data for use by third party institutions and/or make demands on co-authorship of publications etc. 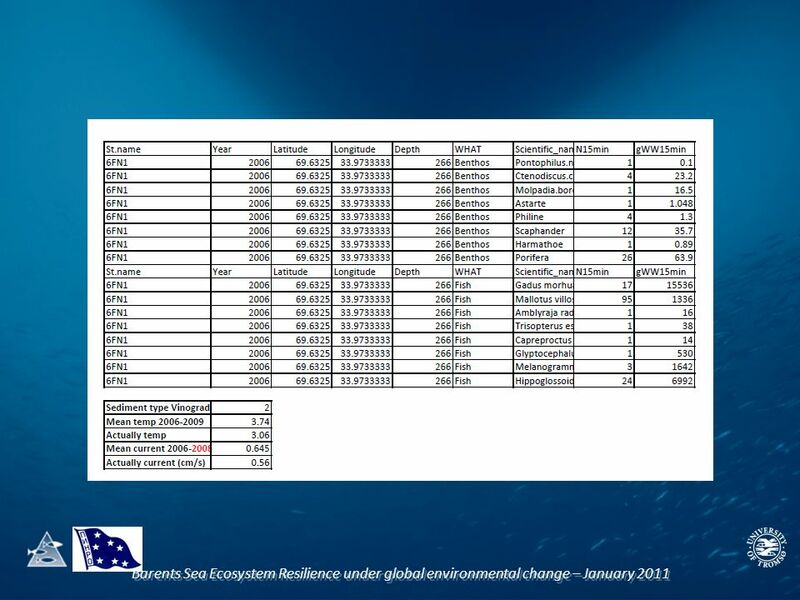 Download ppt "Bar ents Sea Ec osystem Re silience under global environmental change Data workshop Tromsø March 2011." OVERVIEW OF PAYMENT SYSTEMS Sara J. Scherr Presentation to CARE/ WWF April, 2004. 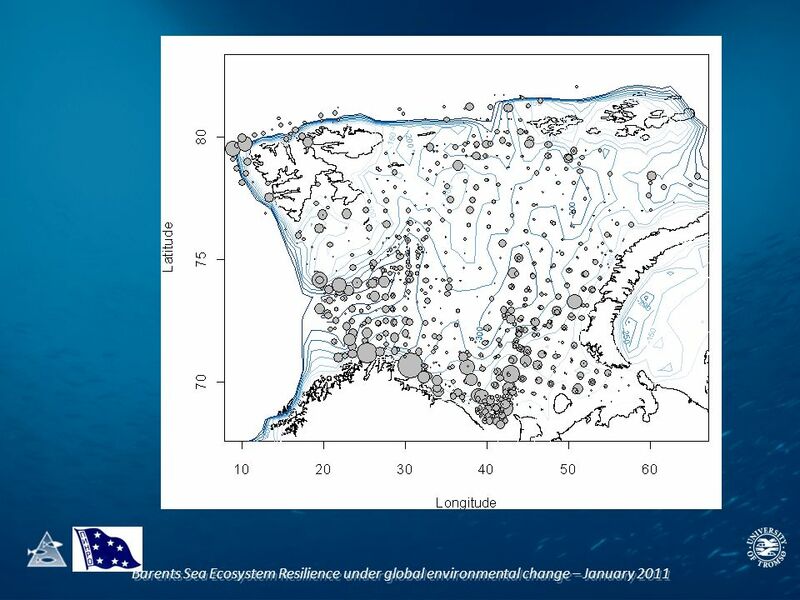 Barents Sea Ecosystem Resilience under global environmental change Annual Meeting – 4-7 December Paris. Barents Sea Ecosystem Resilience under global environmental change Annual Meeting – 4-7 October Herdla. Measuring the vulnerability of a community to a given pressure: Benthos species and bottom trawl in the Barents Sea. Jørgensen, LL, Certain G, Thangstad. 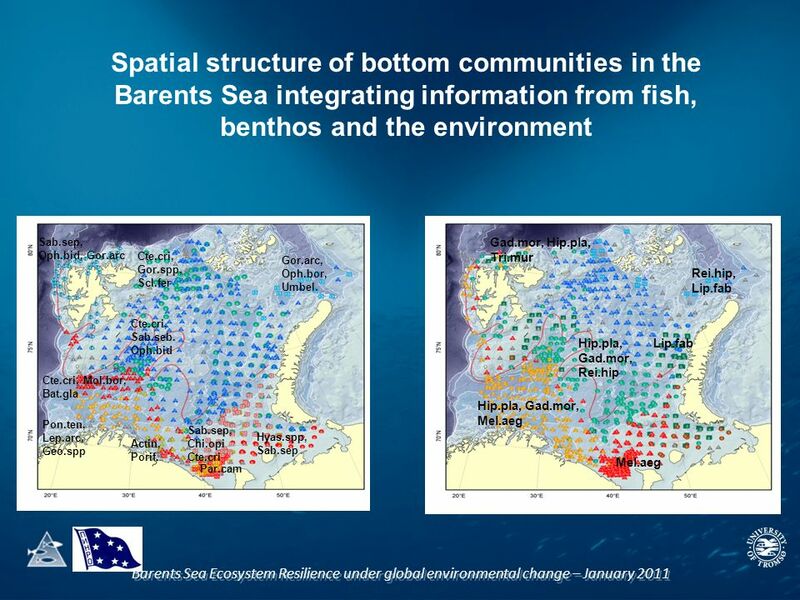 Barents Sea Ecosystem Resilience under global environmental change Annual Meeting – December Paris. 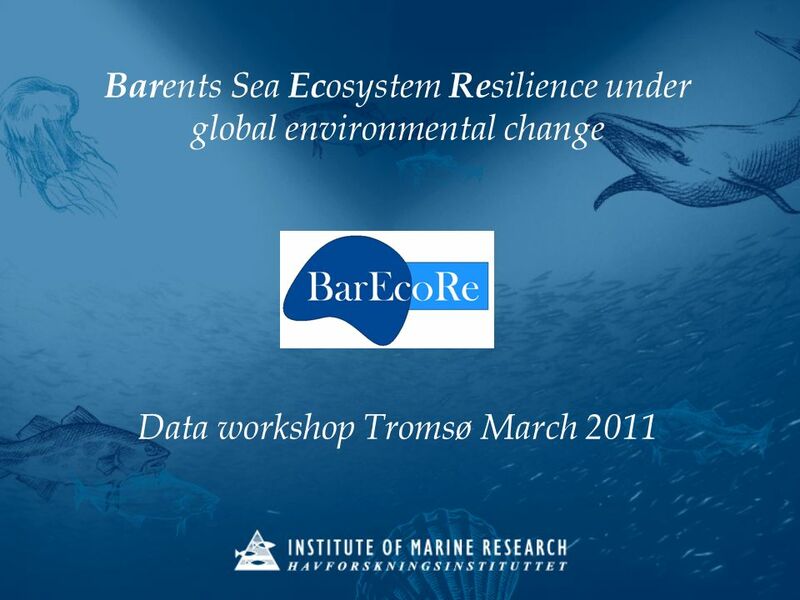 BarEcoRe: Bar ents Sea Ec osystem Re silience under global environmental change Food-web topology workshop 8-9th June 2011. Bar-EcoRe WP3: Population distributions. Bar-EcoRe kick-off meeting 15/06/2010 – WP3: population distributions Bar-EcoRe, WP3: Population distribution. Review of Science and Technical Progress from the Perspective of Wildland Fire / Wildfire Risk Preparatory Workshop on Science and Technology for the Global. Regional Workshop on GEO Methodologies Chiang Mai, Thailand, 8-11 September 2008 Presented by: MT Wilson Technical Officer, Environmental and Disaster. Development Alternatives SOUTH ASIA E N V I R O N M E N T O U T L O O K.
New flagship initiative Adaptive Forest Management and Biomass Production EUSBSR Priority Area Agri Forestry Workshop Helsinki 29 August 2013 Lars Andersson. Opinion of European Economic and Social Committee Rapporteur Mário D. Soares.